Find your MUSE with FBT A true line array system encompassing advanced technology and refined Italian engineering – these are the principles behind MUSE, a new sound reinforcement solution from FBT that redefines the modern line array in terms of power, size, light weight, flexibility and ease of use. True modularity means that MUSE is ready for any application, from a small installation using two enclosures to a large outdoor concert deploying 16 speakers per hang. Each modular MUSE element comprises two 250mm (10”) custom-designed woofers with 64mm high excursion voice coils and two custom B&C HF compression drivers with 25mm (1”) throat. The waveguide, optimised via a series of simulations using BEM finite elements to eliminate distortion, boasts a horizontal dispersion of 90°. It has been designed to present an optimum load to the driver’s diaphragm at 800Hz, thereby allowing the propagation of an acoustic wave in the horizontal field up to 18kHz. The resulting enclosure can contend with even the most challenging of physical environments, delivering an ideal cylindrical source, while the acoustic configuration of the central horn offers a particularly linear and symmetric horizontal dispersion. FBT has also applied its Italian design expertise to the cabinet, creating an enclosure that is equally rugged, practical and stylish. Constructed from 15mm Birch plywood, each MUSE element incorporates two die-cast aluminium handles and fully integrated hardware to suit any application. Up to 16 MUSE enclosures can be flown with ease in a single array, boasting a safety factor of 10:1. Each cabinet can be splayed in 2° increments via simple pin adjustments on the integrated fly-ware, from a minimum of 0° to a maximum of 10°. No matter the application, MUSE brings an easy-to-use functionality and elegant aesthetic to every project. Inside the box, power is courtesy of the convection-cooled, 600 +300 Wrms Class-D amplifier module, housed in a protective, fully sealed die-cast aluminium chassis. Meanwhile the onboard DSP offers a choice of eight presets, allowing users to easily configure their MUSE system depending on the curvature of arrays and the number of speakers used. 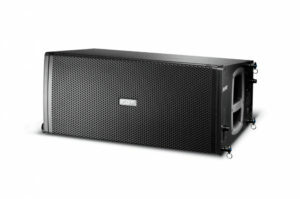 To extend the low frequency performance of a MUSE system, users can benefit from the matched subwoofer – the SUBLine 218SA, which is ideal for ground-stacking. 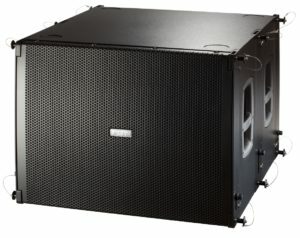 Each SUBLine218SA incorporates two 460mm B&C woofers and a 1200W Class-D amplifier with a switch-mode power supply. Alternatively, MUSE can be matched to the MITUS 218SA sub, boasting two 460mm neodymium loaded woofers from B&C, and a 2000W switch-mode Class-D amplifier capable of an SPL of 145dB. With its unique focus on modularity and working in conjunction with EASE FOCUS 2 PC software, MUSE allows you to build the ideal solution to any sound reinforcement challenge.